"The Fate of the Furious" crossed the finish line on Monday as the biggest global opening in movie history. 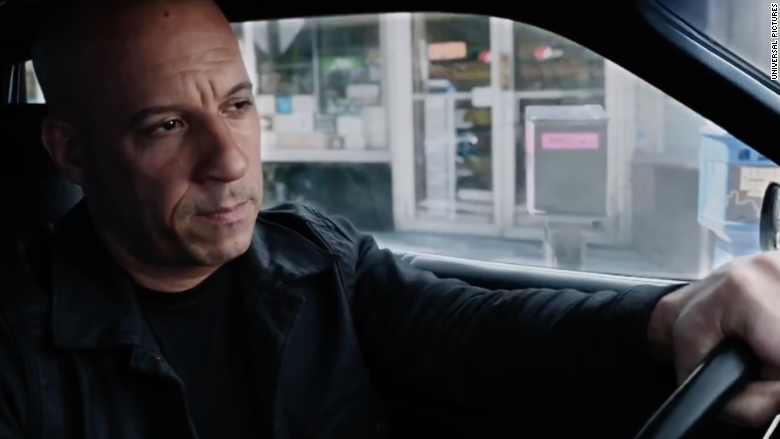 The eighth film in the popular "Fast and Furious" franchise pulled in $532 million at the box office around the world in its first weekend, according to its studio, Universal Pictures. That total beats the global record held by Disney (DIS)'s "Star Wars: The Force Awakens," which made $529 million worldwide its opening weekend in 2015. There's one caveat: "Force Awakens" didn't have the benefit of opening in the world's second largest movie market, China, until a month after it was initially released. "Fate," meanwhile, opened in North America and 63 international markets, including China, the U.K. and Mexico. "Fate" also broke box office records for bringing in the biggest international opening in movie history. The film made $433.2 million overseas, surpassing the record $316.7 million that "Jurassic World" made abroad in its first weekend in 2015. Domestically, "Fate" made $98.8 million over the weekend. "The Fate of the Furious" revved its engines at the worldwide box office this weekend. The film also drove past records in China, a growing movie market. It nabbed the country's biggest three-day opening of all time. The record-breaking weekend of "Fate of the Furious" is good news for the future of 16-year old series. Universal has already announced a ninth and tenth installment for 2019 and 2021. "This is an astonishing feat for a decade and a half old franchise that launched as a marginalized car culture movie with no stars and no imaginings of a long-term franchise future," said Paul Dergarabedian, senior media analyst at comScore.